The article says there are four types of personalities that fall into four categories. Thinker, Relater Director and Socializer. I find myself between two; the thinker and relater. Those who know me well should agree. Usually introverts; thinkers are very analytical. They consider every single detail from beginning to end, making sure all angels are covered. Thinkers appreciate an organized setting without chaos. This kind of behavior is creative, well organized, gets things done in order to meet deadlines, precise, intense thinkers and very trustworthy. This is a wonderful behavior for business, in regards of looking for accuracy. “Can’t we all just get along!” these are people who love togetherness and are non confrontational. They like harmony. They thrive in group involvement, like to maintain peace and is never aggressive. It’s great to want people to join forces and try and accomplish one common goal. Directors are driven by the need to control and to achieve. Directors are goal-oriented go-getters who are most comfortable when they are in charge of people and situations. A Director’s motto could be, “Lead, follow, or get out of the way.” In general, Directors are fast-paced and task-oriented. Socializers are open and direct. They are friendly “party-animals” who like to be in the action. Their primary strengths are enthusiasm, charm, persuasiveness and warmth. They are eternal optimists with an abundance of charisma; qualities that help influence people and build alliances to accomplish their goals. Socializers care less about winning or losing than how they look while playing the game. Socializers are risk-takers who base many of their decisions on intuition, which is not inherently bad. 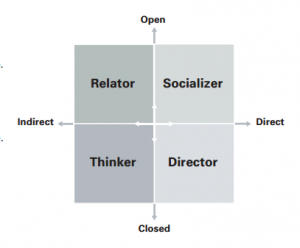 Think about the names; Director, Thinker, Relater and Socializer. Which is your fit? Lose an Hour, Gain Sunlight.